Summer is really a problem when it is hot outside, especially when you have things to do and at the same time to have your kids together. An outfit really comfortable and with pastel colors in order not to increse your heat in your body, is always the solution! What I love this period is simple white….ok…almost simple. White linen pants and a white t-shirt are the most common outfit for the Summer but again can always be different with different accessories. 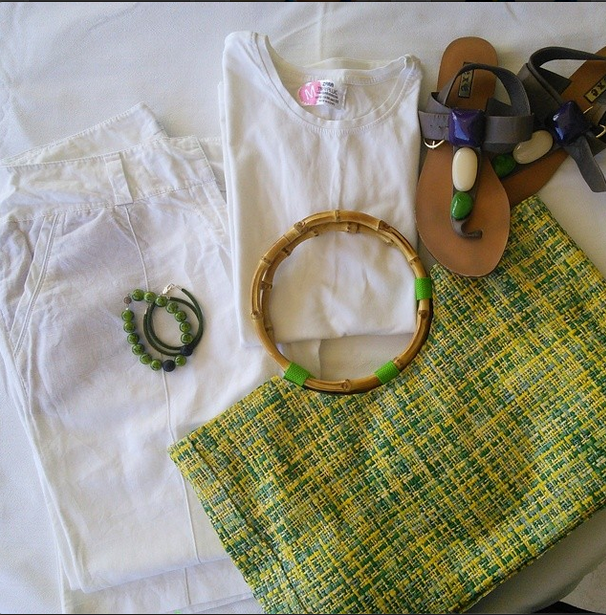 My mood today was green and yellow , so I completed my outfit with these colors. Stackable bracelets, flat sandals with gems and a wickerwork handbag are some pieces great to use and to add more color in your style. And you know what is the best part? that if you replace these accessories with goldish, then you will have an outfit perfect for your night exodus or with blue you are going to have an all time classic nautical outfit etc…so..what is your favorite color in your accessories with a pure white outfit?